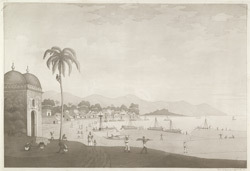 Aquatint with etching of a view of the village of Rajmahal by James Moffat (1775-1815) and published in Calcutta in 1806. James Moffat, a Scotsman, was based in Calcutta from the age of fourteen and is thought to have learnt his trade as an engraver in the city. Rajmahal is located along the right bank of the Ganges in Bihar. In 1592, it was chosen as the capital of Bengal by Man Singh, a Rajput general who worked for Mughal Emperor Akbar (r.1556-1605). Rajmahal remained the capital until 1607, when it was shifted to Dacca. Sultan Shuja, the governor of Bengal, moved the capital back to Rajmahal in 1639. The capital was shifted again in 1707, this time to Murshidabad.